Asparagus and rhubarb often provide some of the first garden harvests of the year, a welcome treat after a long winter. You may not even need to plant asparagus, as it grows wild in some places. (See below.) We’ll share how to grow and harvest asparagus, plus tips to keep your bed in top shape and how to find wild asparagus. First, you need to decide on a location. With any perennial, you want to do a good job of preparing the planting area, since the plants will be there for many years to come. Asparagus can be grown in zones 3-10. 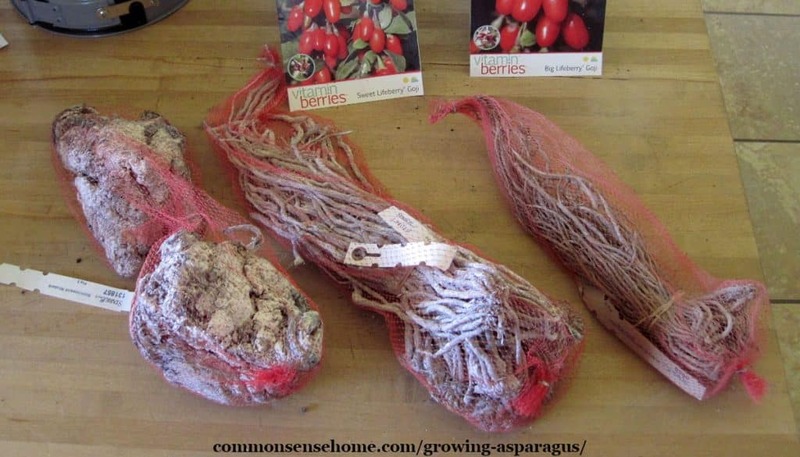 The photo below shows mesh packages of rhubarb and asparagus crown from a mail order nursery. How long do asparagus beds last? Your beds should easily last for 15 years or more with proper care. As noted, Laurie’s neighbors have been harvesting from their patches for over twice that long. When should I plant asparagus? 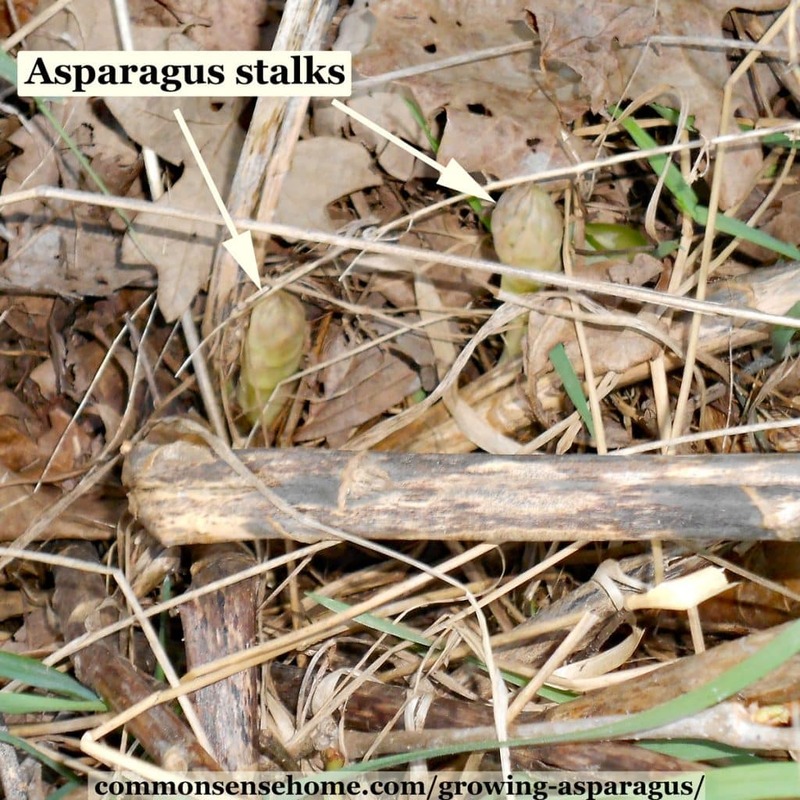 Plant asparagus crowns or transplants in the spring after danger of frost has passed. Soil pH of 6.5 to 7.0 – Do a soil test. Add lime to increase the pH if needed. Ample soil moisture, but not “wet feet”– Use raised beds where standing water may be an issue. If you plant in low lying areas, you may also lose spears to late spring frosts. Sunlight – Try to plant where you have full sun (five or more hours of daylight exposure). The plants can tolerate light shade. If planting near other garden plants, place asparagus on the north side of the bed so that they don’t block the sun for other plants as they mature. Fertile soil – Add compost or rotten manure, and perhaps some rock phosphate powder to boost root growth. Low or no weed competition – Smother, solarize or till to clear weeds and grass before planting. Ideally, prep future asparagus beds in fall for spring planting. Space to Grow – Place the crowns 12 inches to 18 inches apart in rows that are 3 feet apart. Dig a trench 6 to 8 inches deep. Work in a generous amount of organic material such as compost or rotten manure into your planting trench. Place one year old crowns every 12-18 inches down the row. Cover with 2 inches of soil and water well. As shoots begin to appear, fill in the trench with soil, leaving a few inches of the shoots exposed. Repeat as needed until the trench is level. It’s important to plant at the right depth so the spears don’t emerge too early in spring and get damaged by frost. Be gentle with young asparagus plants. Their roots are shallow. Regular, even watering is important, especially during the first 3-5 years. Cultivate shallowly and try to remove weeds when they are small. Organic mulch such as leaves or straw can help keep down weeds and moderate soil moisture. 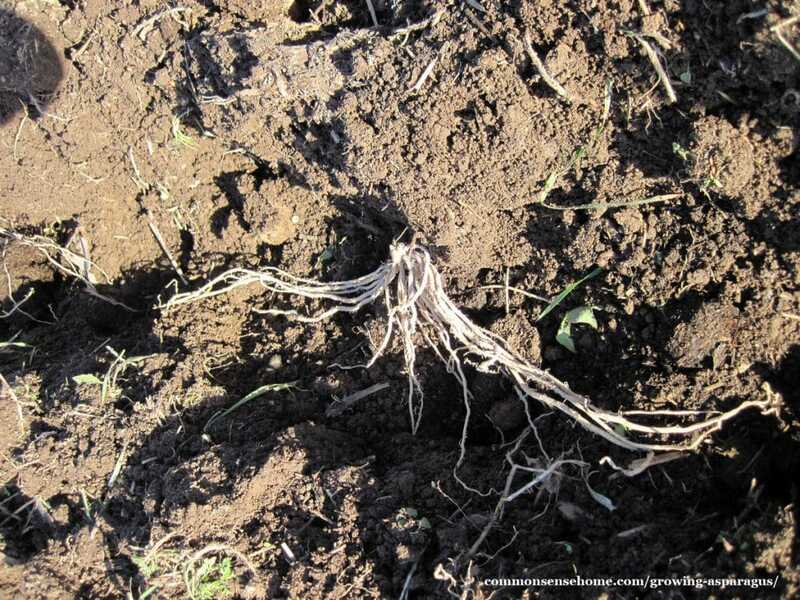 Asparagus spreads as is grows, and deep cultivation can damage the root system. No roto tilling! Pull back the mulch in early spring and dress the rows with 1-2 inches of compost. You may also wish to apply a complete fertilizer such a 5-10-20 at a rate of 1 pound to 10 feet of row. Dress with another inch or two of compost at the end of the cutting season each year. The ferny growth of asparagus puts energy back into the roots for the next year’s harvest. 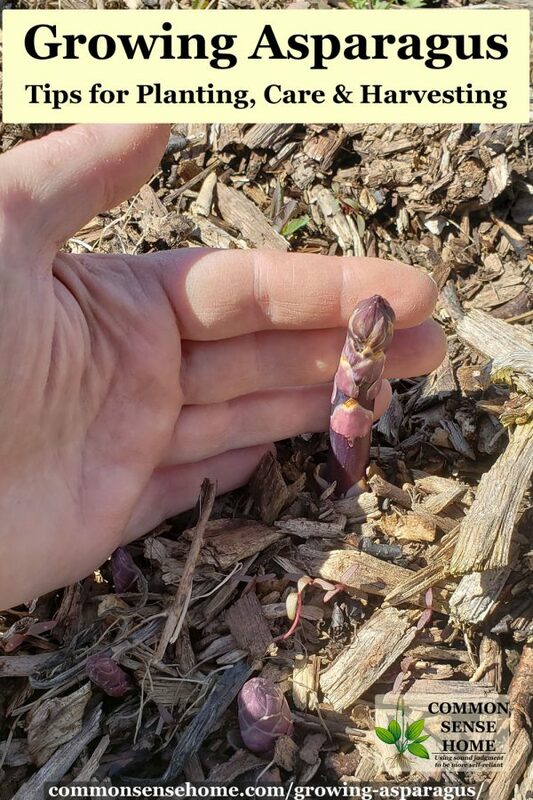 The photo below shows a first year asparagus plant in fall. Laurie’s neighbor has some of his well-established asparagus patches right in his lawn. He mows them after picking to keep weeds short. This is a little rough on the asparagus plants, but is an option if you have a large, older patch and more than enough asparagus. To winterize your asparagus bed, you can top dress with compost after the plants freeze and turn brown. (Or add compost in spring.) Trim back plants to ground level to reduce the risk of disease. (You can also do this in early spring before new shoots appear if you prefer.) Cover the patch with 4-6 inches of straw or leaves. If mice are an issue, go light on the winter mulch. 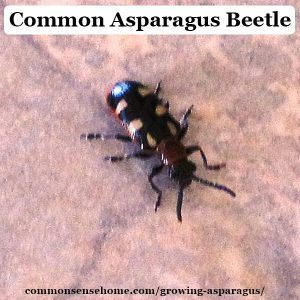 Slugs and asparagus beetles may want to dine on your asparagus. Watch for eggs and beetles, and hand pick them into a container of soapy water. Ducks LOVE to munch on slugs, and won't bother the asparagus. 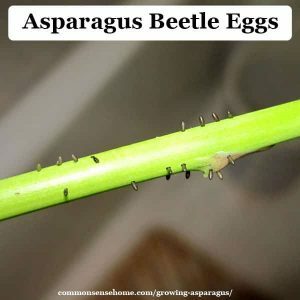 You can read more about asparagus beetles at the University of Minnesota Extension. See The Ultimate Guide to Garden Pest Control for more tips. If you've never had fresh picked asparagus – steamed, stir fried, or even raw – you've missed how good asparagus can be. The flavor is kind of like snap peas, but different in a good way. Don’t harvest any asparagus the first growing season. Let those plants put their energy into getting established. In year two, you can harvest a couple of stalks, but it’s best to wait until the third year. Chose spears that are well developed but the tips haven’t begun to open. Once tips start to open, the spear gets tougher. Pick spears that are 6 to 8 inches tall and have the diameter the size of your index finger. Skinny spears (pencil diameter) are often tough and woody. Cut or break the spear near the soil line. Once you've collected your spears, cook promptly or refrigerate. Check out “25+ Healthy Asparagus Recipes Plus 4 Ways to Store Asparagus” for more information. Harvest for about two weeks the third year, and add about a week each year until the harvest lasts six weeks. Stop harvesting when most of the spears are skinny and let the plants store energy for the next year. Allow the plants to mature and product fernlike 4-6 foot tall foliage. How much asparagus do you get from one plant? Yield varies significantly depending on growing conditions and variety grown. A general rule of thumbs is around 10-12 plants per person for fresh asparagus, more if you want to preserve some of the harvest, too. White asparagus is simply green asparagus that is blocked from sunlight with dirt, mulch or shade cloth. It’s milder in flavor than green asparagus. Varieties such as “Purple Passion” and “Sweet Purple” are purple when raw, but turn green with cooking. Mary Washington is an heirloom variety bred for rust resistance. “Millenium” and “Jersey Knight Giant” are heavy producing, mostly all male plants. Here in northwest Wisconsin, asparagus grows wild in places, along fence lines and under power lines where birds plant the seeds after they eat the fruit during the summer. The mature plants are the easiest to spot along roads and walking sunny fence lines. You can map them out and then come back in the spring. 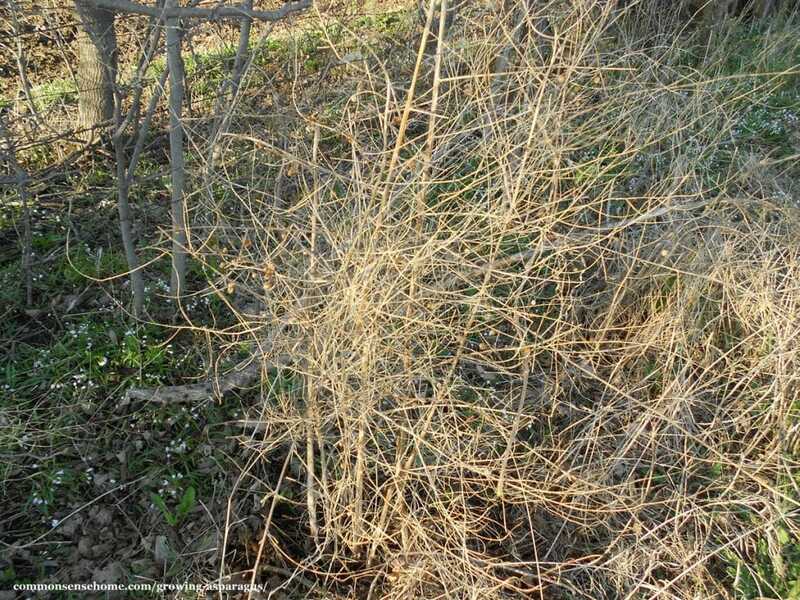 The photo below shows mature plants leftover from fall in early spring. At the base of the plants we see new asparagus shoots popping up. We have over 100 gardening posts on the site, all sorted by category on the Common Sense Gardening page. This post is by Laurie Neverman's brother, Richard Poplawski. Since his service in the Marines, Rich has been a mechanic, fabricator and “fix just about anything” guy for over 20 years. He lives in northwest Wisconsin in the farmhouse that was owned by his grandparents, and maintains a large orchard and perennial plantings, as well as a vegetable garden. 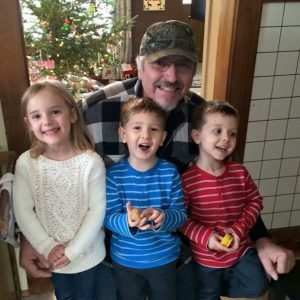 He loves spending time with his grandkids, introducing them to gardening or getting in some fishing with “Papa Rich”. Originally published in 2012, updated in 2019. Are there any suggestion for growin rhubarb in se Kansas? Kansas State University has a report on suggestions rhubarb varieties and cultivation for Kansas at KSU Horticulture Report: Rhubarb. Can rhubarb be grown in Florida? We always had a rhubarb plant or two right next to the compost. The compost pile is just a rectangle made out of some pieces of wood to hold it together. Looked like a raised bed basically. Ensures that the rhubarb has lots of nutrients to absorb. That’s a good idea. I’m adding some rhubarb plants this season and may just consider that option. Any information for a rhubarb plant that is flowering in Spring? Sounds like it’s stressed from heat, lack of water or poor soil. Check conditions, fertilize and water if needed. Not much that can be done about heat, other than mulch or shade. growing up in Massachusetts we had rhubarb growing in the old barnyard. As kids we just picked it and chewed on the sour stalks. We never took special care of it,it just grew. my sister actually won first place at the fair for the size of the leaves. Love rhubarb sweet or sour! I have an absolutely HUGE plant that’s probably 4-5 years old (I can pick enough stalks for 20 cups chopped or so and not look like I made a dent in it). Do I have to divide it, or do I just let it keep doing it’s thing? BTW, it’s a mostly green variety planted in full sun in a raised bed, which we water quite a bit in the summer — I can pull rhubarb all the way until frost, no problem. Technically, for optimal plant health, it should be divided every 5-6 years. That said, I know my neighbors have a large patch of rhubarb that has not been divided in the 10 years we’ve known them, and my mom never divided hers for as long as I can remember. In order to keep the plants healthy, rhubarb should be divided every five or six years during winter, when dormant. Each plant can be split into three or four separate crowns with a spade. Make sure each crown has an ‘eye’, or a large bud that will provide next year’s shoots. I had 4 or 5 good sized Rhubarb plants until the local gas company came through and took them out with one scoop of their back hoe! When can I plant more? What’s the best time of year? Also where’s the best place to get it? And type? Many hardware stores and garden centers now carry rhubarb starts in spring. If you have a neighbor with a reliable patch, perhaps they will let you get a start from their patch. That way you know the variety is hardy for your area. Do note that the tender young growth when the leaves first start emerging is susceptible to frost, and a hard frost can kill off the plant when it is newly transplanted (once established, rhubarb is very hardy and will simply resprout from the roots). Help – my 10+year old asparagus bed is full of weeds (dandelions, grass, etc.). I do not want to spray to eliminate weeds, and I am worried about damaging the asparagus roots if i dig. What is the best option? Should I just dig out the asparagus plants, clean out the area and replant the old asparagus roots? Also, can I split my rhubarb patch in the fall? I live in Montana at 5,000 ft elevation and spring is quite busy, brief and late (end of May for a week or 2). There are a few different ways to tackle the asparagus. The easiest to do like my neighbors do – they pick, and then mow. Their patch is weedy, but they still get a good harvest. I’m pretty sure their asparagus patch is older than I am. You could also try limited digging/pulling in combination with mulch, to make it easier to access. If you wanted it “clean”, thorough digging and replanting would do that – for a while. A friend of mine combines her asparagus and strawberries, using the strawberries as ground cover. I’d be nervous about stepping on the berries. On the rhubarb, I’d give it a go when you have the time for it. A fall split will likely be a little harder on it, but sometimes you just have to make things work in the time you have.
) (Can’t plant in the ground as we live right on the beach and it’s not soil but sand). It has never turned brown in the three years and I am not sure if I should just cut the whole patch down to soil level or what? Please help as I love asparagus and would really love some I could harvest. 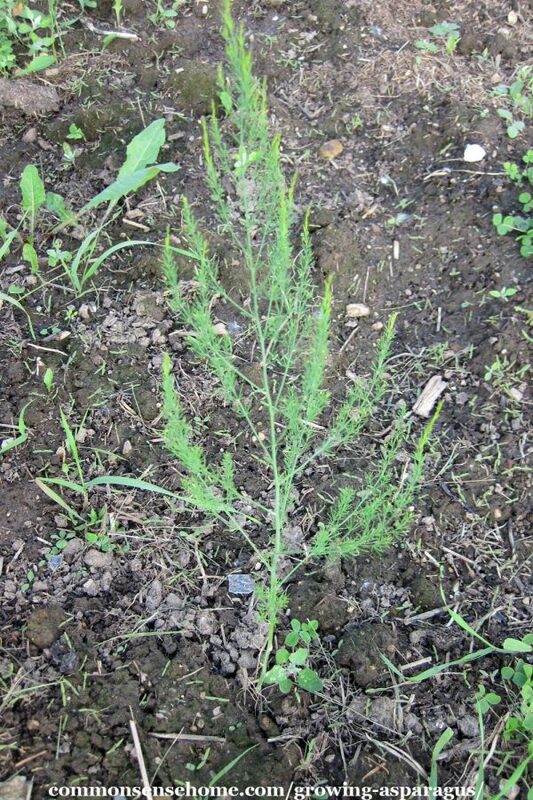 “With a Southern Sustainable Agriculture Research & Education (SSARE) Producer Grant, Gilbert Garza with the Texas/Mexico Border Coalition, cut asparagus ferns below the soil surface every 10 months during the two-year trial, then pruned the ferns back every two months and harvested the spears to extend and maintain a continuous production of asparagus. The result: an asparagus crop that is viable for 10 months out of the year, with only two or three months of low production. “Asparagus is not typically grown commercially in the South because of hot weather conditions and a limited harvest season,” said Garza. “This research showed that asparagus harvest in South Texas, and other warm areas in the region, can provide near year-round production.” In addition, Garza discovered that asparagus production can have two distinct seasons: a primary season that peaks from March through May, and a secondary season that peaks September through November. Low production months include January and August. 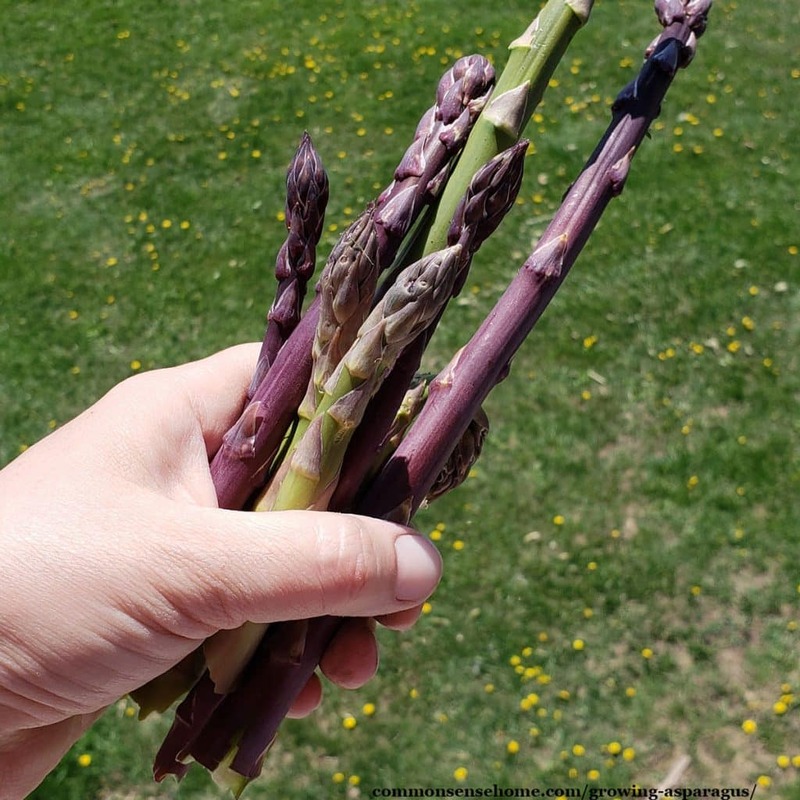 Garza found that the top producing variety in the project was Jersey Supreme, producing 0.6 pounds of asparagus spears per running foot per year of asparagus in its fourth year, roughly the equivalent of 5,268 pounds of spears per acre. Jersey Knight was the next best performing cultivar with 4,980 pounds of spears per acre, followed by Mary Washington, Purple Passion and UC157. Try fertilizing (at least add a heavy layer of compost) and cutting the spears back. That’s awesome thank you so much, as soon as it gets light I’m going to do some pruning.will keep you posted.